As the name suggests, neuromarketing means the application of brain-based research to the discipline of marketing in general and digital marketing in particular. It involves the use of functional Magnetic Resonance Imaging (fMRI), the measurement of brain electrical activity or other technologies used to measure people’s responses to marketing creative, such as copywriting, product descriptions, pricing, packaging, and advertising. For example, researchers may find that a particular stimulus causes a response in the brains of test subjects that’s correlated with a desired behavior (e.g. the release of a ‘feel good’ hormone). Obviously, as a marketer, you’d want to know these cause-effect relationships so that you can apply the principles to your creative, and thereby drive improvements to your key conversion metrics. While neuroscience has been around for decades, it has only been applied to marketing since the mid-2000s. Here’s how we transitioned from ‘user-centered’ to ‘brain-centered’ design. Donald Norman, director of the Design Lab at the University of California, San Diego, in his 2003 book Emotional Design, triggered the digital design community to move beyond traditional usability and towards persuasive, motivational design. He described how humans interact with interfaces on three levels: behavioural (interactions), visceral (‘gut’ reaction), and reflective (‘looking back’ reaction), and how these impressions affect our motivation to interact with brands in a shopping context. Next, Robert Cialdini shared, in his great book Influence, the several psychology-based principles of persuasion, which include things like reciprocation, social proof, liking, and scarcity. Lieberman’s book Social took this discussion to the next level by demonstrating how deeply social interactions drive our behavior. Then came writings from neuro-based thought leaders including Jonah Lehrer (How We Decide), Dan Ariely (Predictably Irrational), Renvoise (Neuromarketing) and Martin Lindstrom (Buyology). They shared many studies that proved how we humans make most of our decisions based on instinct rather than rationality. However, it’s the work of Nobel Prize-winning Princeton economist Daniel Kahneman, as documented in his book Thinking Fast and Slow, that’s most interesting and actionable to marketers. By bridging psychology and economics, Kahneman’s work systematically integrates these two worlds, and thereby unlocks the secrets to human decision making. Since this framework is ‘core knowledge’ for a discussion of neuromarketing, allow me to take a brief aside into brain science. Our instinctive brain makes decisions instantly based on the four Fs: fight, flight, food or f*&k; these instincts are directly tied to our pleasure and survival. This area of the brain also regulates our automatic physiological functions like breathing and heartbeats. The core of Kahneman’s framework is the distinction between two systems of mental processes that drive our decisions and behavior. He calls these two systems ‘System 1’ and ‘System 2’. 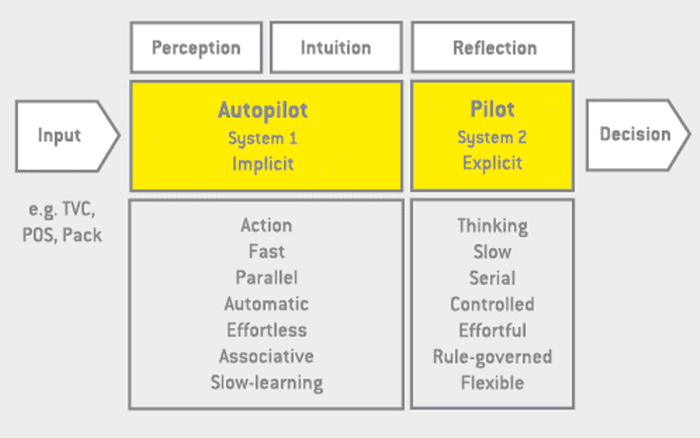 System 1 integrates perception and intuition. It’s always running ‘in the background’ of our brains. It’s super-fast, processes information in parallel is associative and slow learning. It was made for fast, automatic, intuitive actions without thinking. The most highly-skilled mental activities are based on System 1, such as a cardiologist interpreting an echocardiogram trace. In contrast, System 2 is slow, works methodically and logically, and takes a lot of energy because it requires more effort. But this system allows us to make well-thought-out, deliberate decisions. It’s made for rational thinking. The implication for you as a digital marketer is: by communicating in a way that evokes faster and intuitive System 1 responses, your designs and messaging can bypass your prospect’s slower and more judgmental System 2 thinking. This will enable you to drive more ‘impulse’ purchases which will, in turn, raise your top metrics revenue per visitor (RPV), average order value (AOV) and profit margins. 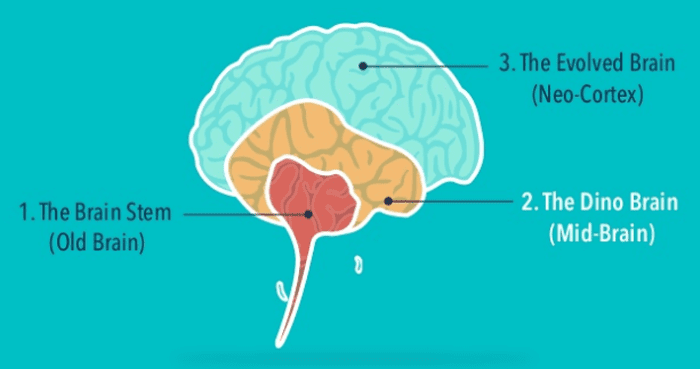 Three hormones in your visitors’ brains most determine the sales effectiveness of your e-commerce website: dopamine, cortisol, and oxytocin. Dopamine is the neurotransmitter often called the ‘reward chemical’. It’s tied to addiction – it makes us feel good. Researchers have recently found that instead of causing you to experience pleasure, dopamine actually causes you to want, desire, seek out and search. It is the opioid system, more than the dopamine system, that is involved in feelings of pleasure. The wanting (dopamine) and liking (opioid) go together: the wanting propels you to action, and the liking makes you feel satisfied (makes you pause your seeking). Often called the ‘stress chemical’, cortisol is used to regulate blood sugar, the immune system, and metabolism. As cortisol goes up, trust goes down. Therefore, your online experiences need to lower cortisol levels by lessening stress. A live chat prompt that asks, ‘Have any questions or concerns that are preventing you from completing your order?’ is an example of how to do this. Oxytocin is a ‘trust chemical’ triggered when high levels of social connection, empathy, and trust exist. Research has found that using a trustworthy communication accelerates the customer’s ability to understand what you’re saying, and it penetrates the emotional parts of the brain (the amygdala first, then other regions). Since your prospects need to trust you before they will buy from you, your marketing creative must trigger the release of this hormone. Are more choices better? Contrary to what you might think, they most often aren’t. Most us know from first-hand experience, whether we’re shopping in the real world or online, how we can get overwhelmed with too many choices. We feel anxious, maybe even ‘freeze’, and we feel relieved when we see that smiling sales consultant coming over to help. Sheena Iyengar, in her book The Art of Choosing (2010), details research on choice in what is now known as the ‘jam study’. Researchers set up booths at a busy upscale grocery store and posed as store employees. They alternated the selection of fruit jams on the table; half the time they offered six choices of jam for people to try, and the other half of the time they offered twenty-four choices of jam. The finding: when there were twenty-four jams offered, 60% of the people coming would stop and taste. When there were six jars, only 40% of the people would stop and taste. But here’s the most interesting result: 31% of the people who stopped at the six-jar table actually made a purchase, compared to only 3% of the people who stopped at the twenty-four jar table. Thus, the fewer choices presentation had 10 times the conversion rate. If ‘less is more’ in a shopping context, why do people seem to prefer more choices? It’s part of that dopamine effect. Information is addictive, so we tend to continually seek more of it. However, just because people want to consume the information, it doesn’t mean they want to act, and it’s action that matters most to you as a digital marketer. You might have a vast product catalog, which is great as you can offer more solutions to more segments of your prospective customers, but that doesn’t mean you need to show all of these products. Include a ’filter’ option on your category pages so your visitors can quickly narrow down their choices. Make it visually prominent so it won’t be glossed over. Offer recommended products and bundles. These make finding and choosing a solution – not just individual products – much faster and easier. Offer a ‘product finder’ tool (also known as a ‘user experience wizard’) on applicable landing and category pages when you have a large selection of products. Create landing pages tailored to more specific Internet search queries, which take these visitors to more specific and higher-converting sales and lead-generation pages. 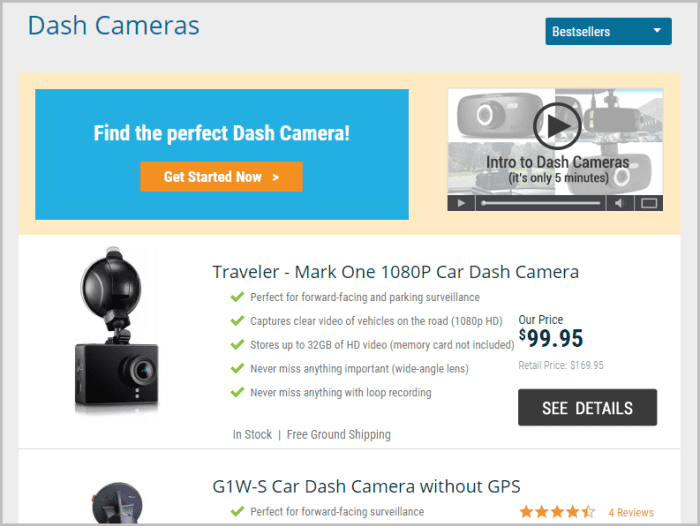 SpyTec, a seller of surveillance products, offers product finders in the main pages for each of its top product categories. Here’s an example of the finder entry point for the ‘dash cameras’ category. 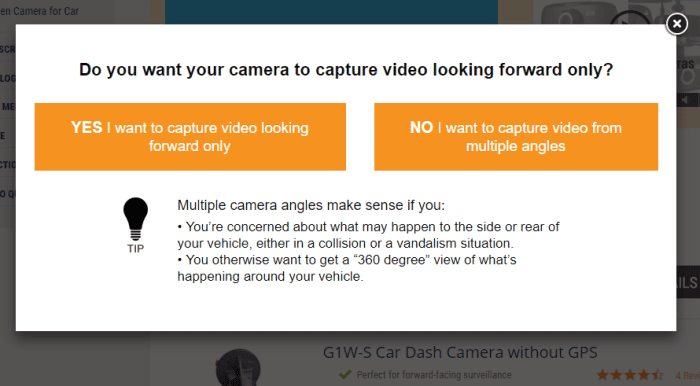 Clicking the ‘Get Started Now’ button takes the visitor to the first of three questions asked to clarify their needs. Based on the answers given, the website then recommends two product bundles – one premium and one standard – and both perfectly tailored to the visitor’s need. This is a great example of ‘solution selling’. Not only does it increase conversions, but it humanizes the experience and respects the visitor’s time, both of which leave the customer with a positive brand impression (the ‘reflective’ part Donald Norman talked about). This blog post is a preview of our comprehensive guide to practical neuromarketing. Read the full guide to learn more approaches to effectively connect with your customers and increase sales.